So, Easter, the time of frolicking lambs and, wait…there are no lambs in Vienna (or Austria). Or very few – different country, different traditions. In fact, it’s the rabbits that rule the Easter menagerie – as you’ll notice if you enter any store. Read on for details of Easter markets and events in Vienna, as well as tips on seasonal travel, weather, food, and traditions. The official Easter school holidays in Vienna run from April 13th to April 23rd. Tip: all kids aged 14 or less travel free on the transport authority’s subways, trams and buses during this time. The city is a popular destination for an Easter break: visitors swap places with the Viennese, who often head to the Alps for a final ski before the spring sun melts all the snow. The Easter markets are the main attraction at this time. Think of them as high-quality arts and crafts markets with a truck-load of eggs and several high-calorie pinches of local cuisine. The Easter market in Palais Niederösterreich is rather special, but only runs for two days, unfortunately. 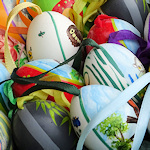 And there’s a 3-day-only Easter market at the gardens at Hirschstetten (these gardens are a little local secret). The Vienna Blues Spring music festival, which pulls together blues musicians from around the world and usually runs from late March through April. The Prater Easter holidays festival, which takes place over the school break in the Prater area (home to the giant Ferris wheel, a theme park, the planetarium, restaurants, an extensive park area and much more). It’s meant mainly for children. (I haven’t found any information for 2019, yet, though). The Children’s Museum at Schönbrunn Palace has its usual Easter activities, including puppet shows and craft workshops. On Easter Sunday (April 21st), the Vienna Boys Choir will sing Mozart’s Mass in C major in the chapel of the Hofburg palace. You can purchase tickets online. Also on Easter Sunday, there’s an “Easter concert” at the Musikverein, where the Bruno Walter Symphony Orchestra performs Brahms and Beethoven. At the Easter weekend (April 20/21), the Wiener Symphoniker orchestra performs “Spring in Vienna” with violinist Renaud Capuçon at the Konzerthaus. See also the general concert and events pages. Two words – eggs and rabbits. You paint, colour, decorate, hang up, or eat the former, and it’s the Easter rabbit who brings the things in the first place. Technically, it’s the Easter hare, since the German word is Osterhase (Ostern = Easter and Hase = hare). Listen closely on the morning of Easter Sunday and you’ll also hear the sound of a million hard-boiled eggs cracking in gladiatorial combat. Learn more about this and other Austrian Easter traditions here. At least, it’s nothing like Christmas, with its wide range of seasonal specialities. There is plenty of rabbit and egg-themed chocolate and candy. And I will openly admit to a desperate love for Lindt’s Goldhase – chocolate rabbits in a gold livery, with a red ribbon and little bell. There’s also the Osterpinze – a relative of the Striezel – which is a soft breadlike pastry made from yeast dough. And Osterschinken (Easter ham), which as far as I can tell is basically various varieties of normal ham with the word Easter added to the front. This is a difficult one to call. March and April in Vienna can see bright sun, but also late flurries of snow. Fortunately, Easter is quite late in 2019, so expect spring-like temperatures. Check (obviously) the forecast before you pack. The Easter period is still relatively low key when compared to Christmas. The only formal public holiday is Easter Monday on April 22nd, 2019, when the shops close. Otherwise, store opening hours are normal. The same principle applies to public transport. A “Sunday” service operates on the 22nd, but otherwise timetables are unchanged. Since the week leading up to the Easter weekend is a school holiday, the “Ferien” timetables apply to trams and buses. This basically means slightly longer intervals in the morning, when kids no longer need transport to school.